Facebook users are spread all over the world discussing and interacting about topics that concern them most. Many users create fanpages on specific (sensitive) topics to initiate discussion on that same. While a given topic may be fine in specific country, it can be considered bad (should not be talked about) about in other countries. 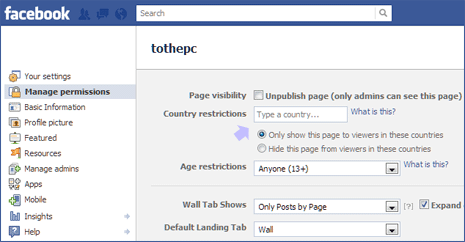 To over come this problem, you can use and configure “Country Restrictions” feature for your fanpage on Facebook. You can use either of two settings: Hide or Visible. Once you type name of one or more countries, you can either select option to hide or show your Facebook fanpage to users from those countries. For example: If you only want your fanpage to be visible to users in USA, just type ‘United States’ and select the “Only show this page to viewers in these countries” option. 1. Login into Facebook profile, click drop down arrow at top right and then click “Use Facebook as Page“. Then click to select your fanpage in the pop-up window. 2. Once your fanpage is opened, click Edit Page button at top right side of the webpage. Then click Manage Permissions tab on the left sidebar to view specific options. 3. In the right pane, check for “Country restrictions” section under “Page visibility” section at the top. Type the name of one or more country in the box provided. Then select either of option, as per your requirement among: Only show this page to viewers in these countries or Hide this page from viewers in these countries. 4. Click Save Changes button at the bottom. This will save your country restrictions for specific fanpage in your Facebook account. Based on selected settings, fanpage will be either visible or hidden to users in specific countries.